I wanted to use colors that were alittle more "manly" for an engagement, wedding, or whatever card... cause you never know when you need one. I also looked thru all my textured templates and wanted to put texture on the solid brown- but I didn't find what I wanted.. so I left it go. 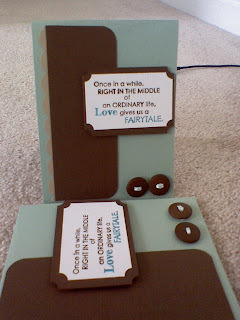 I think the buttons give a more masculine feel to the card, since there is no glitter, ribbon, bows, etc.